Free ISO Creator is a free ISO image file creation tool, can help you to directly create an ISO CD-image (ISO 9660, also referred to as CDFS, Compact Disc File System) file from the DVD/CD-ROM or any folders on your PC. No complicated settings and options, this software is very easy to use. Launch Free ISO Creator, click the "Browse" button to select a source folder, in the "Volumn Name" input the label of the ISO file, then click "Save as" button to set the output path and the ISO file name, finally click "Create" button, you can start creating the ISO file. This software is completely free, the iso-9660 standard ISO format file. 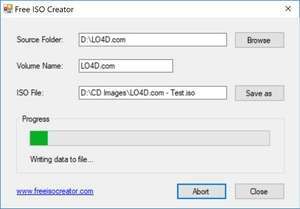 For security reasons, you should also check out the Free ISO Creator download at LO4D.com which includes virus and malware tests. Additional screenshots of this application download may be available, too.